It's a bit funny that I wrote my last post about starting to work full time at Venmo before promptly dropping off for over a year and a half. Oops. Well, I had a great time at Venmo but I left a few months ago to join Teachers Pay Teachers, or TpT as we call it, but not before an extremely brief tenure at Apple (I'll save that story for another time). When I started at TpT we were just starting to migrate applications to a microservice architecture of Kubernetes orchestrated Docker containers (buzzword overload). One of the issues we ran into was how to standardize and automate our container deployment pipeline. 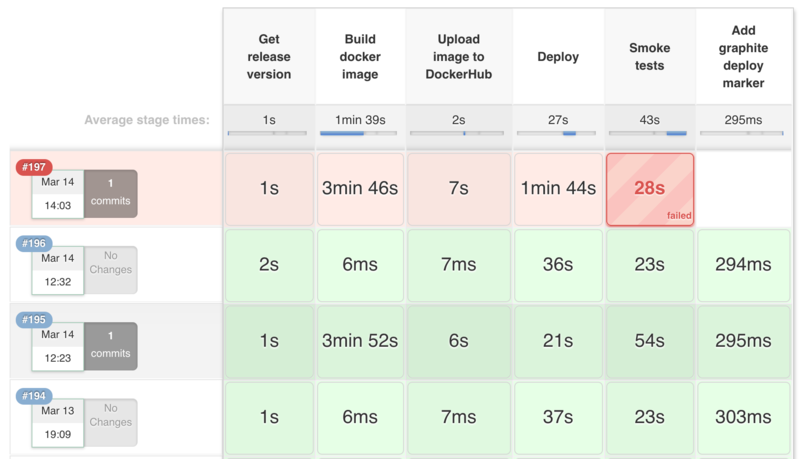 At the time, deploys happened through a mix of bash scripts, automatic image builds on DockerHub, manual image builds on laptops, and Kubernetes configuration editing on the command line. It was clear that we needed to unify deployments and create a framework for future microservices. The ability to version control our job configuration. First class support for defining automated deploy pipelines and available documentation on possible deploy workflows. There was just one small detail, in order to get all these benefits the job configuration needed to be defined in a "Jenkinsfile" containing a script written in a custom Jenkins DSL built on top of Groovy. This DSL has a lot of quirks and can difficult to pick up, but after much frustration and trial-and-error I managed to get our pipeline up and running. Now I want to take you through some issues I faced when writing a Jenkinsfile, discuss some weird bits that I found surprising, show a bunch of code samples for discussing and copy/pasting, and also provide some links to helpful resources. Hopefully this will make it easier for you to get your own Pipeline running and clear up some confusion around Jenkinsfile syntax and usage. It is always tough going back and trying to remember what gave you trouble when you were learning something, but a few points about the Jenkinsfile DSL stuck with me. Dollar signs, $, need to be escaped in string parameters, except when used for string interpolation. Speaking of string interpolation, the syntax is haphazard. There is a helpful gist, but frankly there are no hard and fast rules. You should do almost all of your work within a node block. This is discussed in Jenkins' best practices doc, but it bears repeating. If you don't specify a node block then the step will just execute on your Jenkins master, which is of course bad. You can run shell commands fairly easily with a sh step but only if the exit code is 0. Any other exit code will fail the build and terminate early. sh "(exit 1) || true"
sh "(./script_that_might_return_bad_exit_code; echo \$? > exit_code_file) || true"
You cannot run multiple stage steps inside of a parallel block. You can't define a "post-build" step to execute on job failures like you can with a freestyle job. The suggested solution is to wrap everything in a try...catch. It isn't great or pretty, but it is what is there. Not really a tip, here is the slack_notification function from above. It might be useful on it's own. A serious lack of documentation. It is clear that the Jenkinsfile DSL has enormous power, but there simply isn't enough material published by the maintainers on how to use different features. Features that users would obviously want are not discussed or mentioned, "How can I run a command if a stage fails and my build is going to terminate?" (you can't). Code examples are few and far between. I don't think this is really anyone's fault. I suspect most Jenkinsfiles are kept in private source control and it isn't popular enough to have much material written about it. No way to test your code aside from actually running it in a job. You can't test, execute, or validate Jenkinsfiles locally. So the only option is to stub values and run the code blocks in a test Pipeline job by pasting the snippet into the script block instead of pulling from a remote repo. I did find one source that showed how to validate your code by sending it to your Jenkins master via the command line, but I couldn't get it to work for me. Perhaps you will have more luck? I hope all that didn't scare you off! I still think writing Jenkinsfiles is worth the trouble in order to get access to Pipelines. And as weird as writing scripted Groovy is, I honestly think Jenkinsfiles are an improvement over the previous Jenkins workflow of writing bash scripts pasted inside of code blocks in the GUI. It isn't perfect, but it is an improvement. I'm looking forward to the documentation and tooling around Pipelines to improve in the near future, but I've been able to be very productive with Pipelines despite the limitations of the current toolset.